Among the stream of recent media ventures capitalizing on the craze started by a certain author who castrated the vampire myth with her book series, it’s refreshing to see a more sober and — dare I say — authentic rehash. The Spierig brothers wrote and directed an interesting genre clash in DAYBREAKERS, landing somewhere in the sci-fi/vampire horror crossover zone that the BLADE series inhabits, and yet managing to be sufficiently distinctive. In an appreciated break from expectation, this film’s dark sci-fi world is graced with a primarily orchestral score by talented Australian composer CHRISTOPHER GORDON, whose work was probably not familiar to American audiences until MASTER AND COMMANDER. GORDON has had a fruitful year, with this score and MAO’S LAST DANCER, from last year, thrusting him into the limelight and earning him an award for Best Original Music at the AFI awards in December. 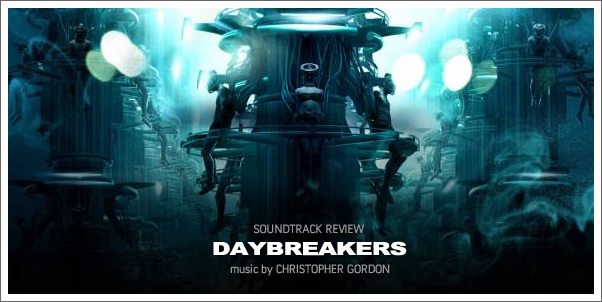 While MAO’S LAST DANCER deserved its award and showcased the best of GORDON’s talent, DAYBREAKERS falls a little short, providing a largely inconsistent underscore of significant orchestral might but little sophistication, occasionally punctuated by gorgeous interludes.